Most people in Western Europe say they believe in God. But in Europe today, believing in God does not necessarily mean belief in the God of the Bible. Indeed, even though all 15 countries surveyed are historically Christian, and nearly all of them still have Christian majorities, fewer respondents say they believe in God “as described in the Bible” than say they believe in “some other higher power or spiritual force.” And substantial numbers of people surveyed across the region do not believe there is any higher power or spiritual force in the universe. 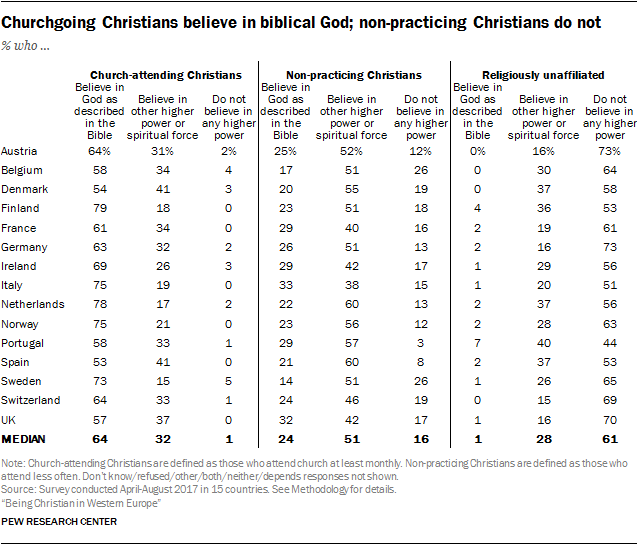 Belief in a biblical God is much more common among church-attending Christians than it is among non-practicing Christians (those who attend church no more than a few times a year). 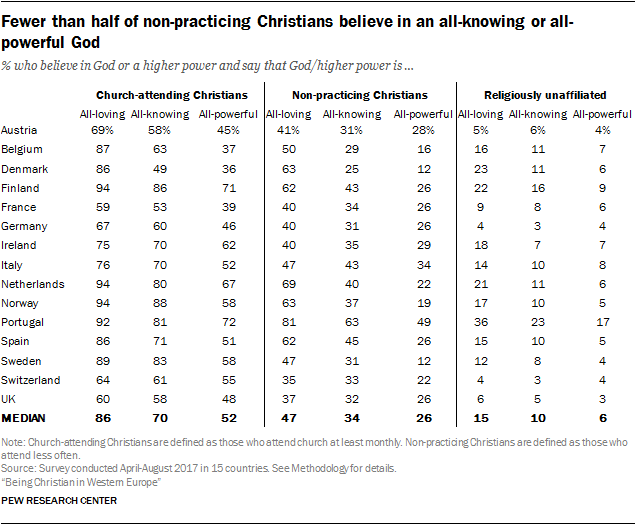 While most non-practicing Christians say they do believe in God or some other higher power, most say they do not believe in God as described in the Bible. And among religiously unaffiliated people in Western Europe, the prevailing view is that there is no higher power of any kind. The survey questions that mention the Bible do not specify particular verses, editions or translations, leaving that up to the understanding of respondents. But it is clear from other questions in the survey that people who say they believe in God as described in the Bible generally envision a deity who is all-knowing and all-powerful, and who loves all people and, ultimately, will judge all people. By contrast, respondents who say they believe in some other “higher power or spiritual force” – but not the God of the Bible – are much less likely to envision a deity with these characteristics. Similarly, Christians who attend religious services at least monthly are much more likely than other Christians to say that God has personally rewarded or punished them, or that they regularly communicate with God. And those who believe in a biblical God are considerably more likely than others to say they have these kinds of interactions with the divine. The prevailing belief in Western Europe is in a higher power or spiritual force that is not the God of the Bible; in 11 of the 15 countries surveyed, pluralities of respondents choose this option. For instance, in Germany, 28% of adults believe in God as described in the Bible, while 38% believe in some other higher power or spiritual force. An additional 26% of Germans do not believe in any higher power, and 8% say they do not know or decline to answer. People in predominantly Catholic countries – especially Italy (46%), Ireland (39%) and Portugal (36%) – tend to have higher levels of belief in a biblical God than people in predominantly Protestant countries. But, still, belief in the God of the Bible is lower in all of these countries than in the United States, where most adults (56%) say they believe in God as described in the Bible. 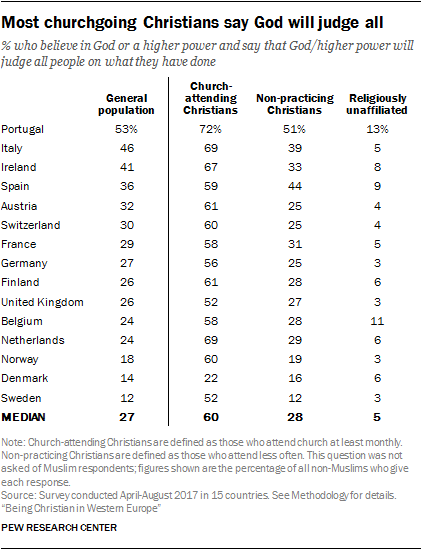 In every Western European country surveyed, at least half of churchgoing Christians believe in God as described in the Bible, while those who are non-practicing tend to believe in some other higher power or spiritual force. Adults ages 35 and over are more likely than younger adults to say they believe in either the biblical God or in another kind of higher power. And on balance, women are more likely than men to believe in God as described in the Bible. For instance, 42% of Portuguese women believe in a biblical God, compared with 29% of Portuguese men. Those with less than a college education are more likely than college graduates to believe in a biblical God. For example, in the United Kingdom, 32% of adults who have not completed college believe in God as described in the Bible, compared with 23% of college graduates. The survey also asked respondents who believe in God or a higher power about three traits that are often associated with the divine in Christianity: being all-loving, all-knowing and all-powerful. Overall, the view that God or another higher power has these characteristics is a minority belief in most countries across Western Europe. A median of just 14% across the region believe God has all three attributes. Consistent with their higher levels of religious observance overall, Portuguese adults are the most likely in the region to believe that God has all three traits. Young adults (under 35) and college graduates are less likely than older adults and people with less education to believe that God possesses these traits. For instance, 16% of college-educated Spaniards say God is all-powerful, while 28% of those who have less education believe this. Churchgoing Christians are more likely than non-practicing Christians to ascribe these traits to God or another higher power. And non-practicing Christians are more likely than religiously unaffiliated people in Western Europe to say God has these characteristics. Indeed, few “nones” associate these traits with God, in large part because relatively few believe in a higher power to begin with. For example, just 6% of religiously unaffiliated adults in France say God is all-powerful. But in some countries, substantial shares of “nones” say they believe in an all-loving God or higher power, including about one-in-five in Denmark (23%), Finland (22%) and the Netherlands (21%). In most countries surveyed, fewer than a third of adults believe God will judge all people on their deeds (median of 27%). But individuals in several predominantly Catholic countries, including Portugal (53%) and Italy (46%), are more likely than others in the region to hold this belief. Churchgoing Christians are much more likely than those who are non-practicing to think God will act as judge. And very few religiously unaffiliated people believe in a God or higher power that will judge all people for their deeds. Throughout the region, younger adults (ages 18 to 34) and college graduates are less likely than individuals who are older and have less education to say God will judge all people. Generally, Western Europeans are considerably more likely to believe in an all-loving God or higher power than a judgmental one (medians of 46% vs. 27%). Consistent with a general sense that God or a higher power is more likely to love than to judge, Western Europeans are more likely to say God has ever personally rewarded them than to say God has punished them because of their behavior. In Spain, for example, 41% of adults believe God has rewarded them, while just 18% believe they have been punished by God. Older Western Europeans (those 35 years old and above) generally are more likely than younger adults to say God has rewarded them. Norway is an exception to this pattern; 17% of older Norwegians say God has rewarded them, compared with 26% of adults under 35. In Belgium, Denmark and the Netherlands, older and younger adults have similar views. Participants in focus groups in five Western European countries shared descriptions and characteristics that they associate with God or a higher power. The focus groups were composed either entirely of Christians or entirely of religiously unaffiliated people. This conversation began with a word association exercise where everyone was asked to either draw or write what comes to mind when hearing the word “God.” In both kinds of focus groups, many participants talked about their idea of a supreme being or higher power. But their descriptions varied and were split mostly on religious lines. Christian participants generally used the word “God” or a male pronoun and spoke about characteristics often associated with God in the Bible – a powerful deity who is all-knowing and all-seeing – while many religiously unaffiliated adults said they do not believe in God at all. However, these patterns were not unanimous; a few Christians expressed doubts about God or described the deity in a more abstract manner, while several religiously unaffiliated adults mentioned belief in either a biblical God or a more abstract power, such as a source of balance in the universe or a force connecting all living things. While many could give a description of God or a higher power, a lot of the religiously unaffiliated participants and even some Christians provided reasons they do not think that such a being, or force, exists. They said the existence of a biblical version of God or a higher power conflicts with their belief in logic, reason and science. For details on the focus groups, including locations and composition, see Methodology. The survey also asked people who believe in God (or some other higher power) whether that higher power talks to or communicates with them. In several countries across the region, at least a quarter of adults say God or some higher power communicates with them somewhat regularly. In other countries, such as Belgium, Denmark and Sweden, lower shares say they have monthly communications with God or a higher power. And across most of the region, very few people say God communicates with them on a daily basis, although in Portugal, more than a quarter of adults (28%) say this. Churchgoing Christians are much more likely than non-practicing Christians or “nones” to say God communicates with them on at least a monthly basis. For example, a majority (72%) of Swiss Christians who attend religious services at least monthly say God talks to them monthly or more, but just 36% of Christians who attend less frequently say this, as do just 3% of religiously unaffiliated Swiss. Women are more likely than men to say God communicates with them regularly. For example, 25% of women in Norway say this, compared with 12% of men. And adults ages 35 and over also are more likely than younger adults to say God talks to them. Overall, an image of an omnipotent and omniscient God is more commonly held by people who believe in a biblical description of God than by those who say they believe in some other kind of higher power or spiritual force. A regional median of 54% of those who believe in God as described in the Bible say God is all-powerful, compared with a median of 27% among those who express belief in some other higher power. A similar pattern is seen on the questions about whether God is omniscient (medians of 72% vs. 38%), loves all people (86% vs. 58%) or will judge all people (59% vs. 31%). Believers in a biblical God are also more likely to say they have had personal interactions with God. Those who believe in God as described in the Bible are more likely than other believers to say God has rewarded them (52% vs. 32% medians) or regularly communicates with them (78% vs. 55%).